LMS supplies fuel gauging and management solutions to the aerospace industry. Our customers include some of the largest and most innovative OEMs and Tier I Integrators in the Industry. We are committed to a collaborative relationship with our customers to create, design, and build superior products that meet or exceed customer expectations. LMS’s core business continues to be military defense, specifically military rotorcraft. We currently support such platforms as Chinook, Apache, and Blackhawk, Huey, and Cobra (H1 Program). We continue to see a future in that market sector, albeit with fewer new platform opportunities. LMS continues to expand its presence in the commercial sector, both on fixed wing and rotorcraft platforms. We have leveraged our expertise in military auxiliary fuel gauging systems to win new customers in the commercial auxiliary market. We have also penetrated the hybrid-electric market and continue to see exciting opportunities in the unmanned aerial vehicle market sector. LMS now employs approximately 44 people in Northwest Vermont. We have assembled a team of engineers with a reputation for delivering designs that meet or exceed the most demanding customer requirements. Our assembly and quality assurance teams produce approximately 2200 units in a calendar year with an on-time delivery metric approaching 99% and a quality metric of better than 99%. 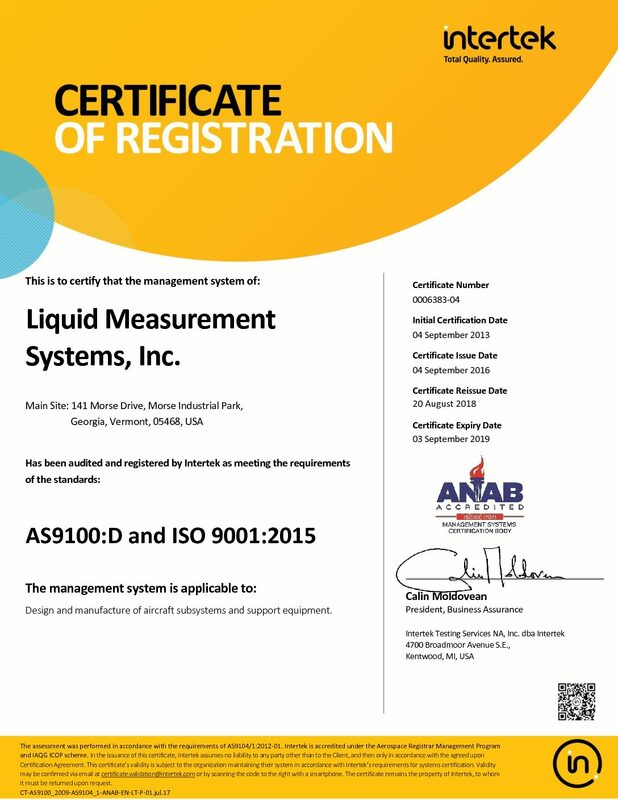 We are fully certified under AS9100C. To be the preferred fuel gauging supplier in the aerospace industry with a reputation for reliability, responsiveness, and innovation. At LMS, our mission is to design and build the world’s best measurement solutions. We are committed to the superior safety, quality, and accuracy of our products, and to working with our customers to achieve their objectives. Engagement – We are fully engaged in the success of our partners, customers, suppliers, end-users, and stakeholders. Excellence – We are committed to excellence in everything we do. Integrity – We mean what we say and act accordingly. Innovation – We encourage curiosity and outside the box thinking. Teamwork – We are accountable and supportive of one another. Committed to Reducing our Impact on the Environment. Reducing solid waste by recycling and purchasing recycled products (giving precedence to post-consumer recycled products). Conserving energy, water and other natural resources. Reducing the use of toxic products.